LOS ANGELES, Feb. 7, 2019 — In response to legal action by the Center for Biological Diversity, the U.S. Fish and Wildlife Service has finalized a recovery plan for the endangered Southern California population of mountain yellow-legged frogs. The plan calls for a wide array of recovery actions and research efforts to deal with the multitude of threats to the survival of this highly endangered frog. Since the 1900s mountain yellow-legged frogs have disappeared from nearly all of their former range in Southern California. By the 1990s fewer than 100 were thought to remain in a handful of isolated headwater streams. Predation by introduced fish, primarily non-native rainbow trout, is one of the best-documented causes of the frogs’ decline. Another primary threat is habitat damage from recreation and other factors. The recovery plan prioritizes the continuation of captive-breeding efforts and augmentation of existing populations, as well as reestablishing populations in areas historically occupied by the frogs. The plan emphasizes dealing with major threats to the frog, including predatory non-native trout and pollutants, such as chemicals used in wildfire management and illegal marijuana operations. The plan calls for range-wide surveys and monitoring, research on genetic diversity and chytrid fungus and addressing recreational impacts, including those from hiking, swimming and rock-climbing. Recovery plans are the main tool for identifying actions necessary to save endangered species from extinction and eventually remove their protection under the Endangered Species Act. Research by the Center has found that the status of species with dedicated recovery plans for two or more years is far more likely to be improving than the status of those without. The mountain yellow-legged frog (Rana muscosa) occupies rocky, shaded streams with cool waters originating from springs and snowmelt. A “distinct population segment” of mountain yellow-legged frogs in Southern California has been federally listed as endangered since 2002. 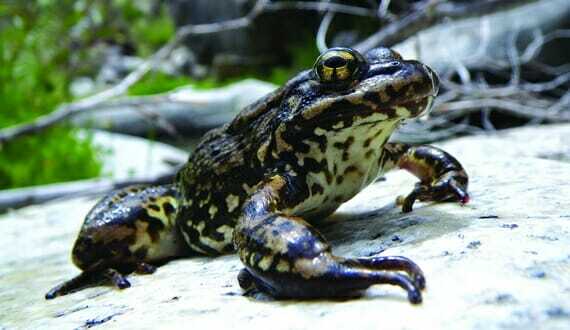 Historically mountain yellow-legged frogs in Southern California lived across a wide range of elevations and in a wide variety of wetland habitats. But the frogs are now limited to 10 precariously small populations in the San Gabriel, San Bernardino and San Jacinto mountains.